You are spot on about the work grader's do to identify and diffferentiate between new or returning players. One club recently advised me of a new player by first name, the opposition provided a surname, but it was only after my game against him subsequently that we were able to establish these details were correct and find his USCF rating. Some clubs just don't help their administrators at all, even after the annual reminders. We went through similar pain in Leicester. Firstly we brought in online result reporting but, due to opposition from some clubs, it was merely an option and we had to retain the 21 day (!) deadline for submission. Gradually though, teams and players saw the benefits of quicker online result updates and so more teams submitted results online, and more quickly. Now, we have changed the rules so that online result submission is the only form of reporting and the time limit is 7 days. Most actually do it same or next day. So the carrot is up to date results and tables on the website. The stick is penalties for late submission of results (deducting match points from teams league total). It's sufficient enough that we rarely have to apply it. An interesting by-product is that it tended to be older stuck in the muds who objected to all this on-line malarky at the outset. However, when these clubs were next getting their results updated in a timely fashion the younger players appear to have stepped forward and volunteered to take up positions - a direct result of our move to online technology I believe. Sean Hewitt wrote: Firstly we brought in online result reporting but, due to opposition from some clubs, it was merely an option and we had to retain the 21 day (!) deadline for submission. And then we wonder why newspapers don't publish the results anymore! The decision of newspapers to publish chess results will depend on space in the paper, the reliability of copy, and the timeliness of the supply, and a few others. This is indeed one of the reasons why I would like to move to more immediate reporting of results, because the sooner I get one stuff the more can be done with it. At present I aim to post some observations on the latest round of fixtures on the website at regular intervals, but opening discussions with local press may follow. However, it is worth noting that the last ten to twenty years has seem many local papers cut down on reporting of a number of minority sports. Table tennis and netball, snooker and darts all used to get more coverage, and you no longer get as many cricket results from local clubs in the summer. This does place the onus on the chess organisation to ensure the material is printworthy. Could FGSl be a new ECF grading method? May I ask what do you think about FGSl (FIDE-like Grading Sytem with live internal grades) defined below in "FIDE-like grading system with internal live grade calculation and FGSl..." section? In order to illustrate the calculation method the lighthouse keepers and some other examples follow. I know that Roger is interested in the example where a 140 player scores 50% against a 160 opposition, so say if a 140 player scored 50% against a 160 opposition (i.e. the opposition's live grades were 160 on average) the 140 player would need approximately 95 games to get a grade of 159.5. Let us consider a fast improving junior with a grade of a 100 who scored 75% against a 140 opposition (i.e. the opposition's live grades were 140 on average) in 80 games he played in the grading period, the junior's new FGSl grade for the grading period would be approximately 159.53. In order to implement FGSl or equivalent FIDE-like grading system with internal live grade calculation one would need to enforce keeping records of date and time when the games finished (so that the games can be sorted in chronological order before grading for a desired grading period). If you calculate using live grades internally the frequency of grade publication does not affect the grade calculation, though it may affect the things such as determination who is eligible to play in certain events, etc. If ECF would adopt FGSl or equivalent FIDE-like grading system with internal live grade calculation, the choice of the length of the grading period (be it a season, six or two months, etc.) is more of an administrative issue (i.e. you collect the game results and run the program to calculate new grades for the new grading period instead of once a year every six or two months, etc.). 'n0' can be fine-tuned, instead of setting 'n0=30' one may find another constant to fit better the ECF situation. 'k' factors of graded players in the games where they play ungraded players may be set to zero when 'k' factors of ungraded players in the games where they play graded players would be set to 2 (we honour 'kij+kji=k=2' if 'i'th and 'j'th players played at least one game in the grading period). One may consider using variable 'k' factors, honouring 'kij+kji=k=2' if 'i'th and 'j'th players played at least one game in the grading period, to account for the players' grade trust estimated on the basis of the frequency of play (this would be sort of Glicko 1 idea). Say, if a player played only a few games in the last grading period his grade should not be equally trusted as the grade of a player who played a lot of games in the last grading period, and the grade of the player whose grade is less trusted should be corrected more (his 'k' factor is greater than 1) than the grade of the player whose grade is more trusted (his 'k' factor is less than 1), honouring 'kij+kji=k=2'. where for FGSl (FIDE-like Grading System with internal live grades) 'kij=kji=1' if 'i'th and 'j'th players played at least one game in the grading period, 'kij=kji=0' if 'i=j' or if 'i'th and 'j'th player did not play each other in the grading period, 'pij=f(dij=gi-gj)' where 'f(dij=gi-gj)=100/(1 + 10^(-(gi-gj)/50))' and 'n0=30'. 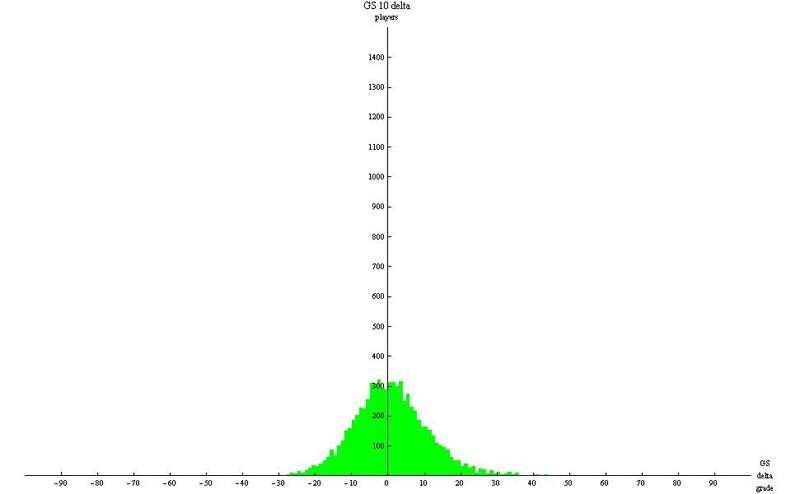 If a 120 player plays a 100 player then the expected performance of the 120 player is approximately '50+(120-100)=70%', in FIDE case it would be approximately '50+(1610-1450)/8=70%' (i.e., ECF has no scaling factor of 8 ). It does not seem a bad Idea although I think it's best to not to change the ECF grading around anymore as it's going to take a few years to get back to normal, due to inflation. The G30 rule below has been taken into account in the calculation. Rule G30: The Grade is calculated by dividing the total number of points scored by the number of games played. If there are at least 30 games in the current period, then the Grade is based on these games alone. If there are not, results are brought forward from the previous period to make the total up to exactly thirty. If there are not 30 games in the two seasons together, results are taken from the season before that. Games are never taken from further back than this; the maximum is two prior grading periods. The results can be found in ags3grade10.zip file which can be downloaded from... http://www.jurjevic.org.uk/chess/grade/. The Zip file contains ags3grade09.txt (textual tab delimited), ags3grade09.xls (Excel spreadsheet document), gradeslive.csv (Excel spreadsheet document, official 2009 grades), gs3grade10.txt (textual tab delimited), ags3grade10.xls (Excel spreadsheet document) and grades2010v2.csv (Excel spreadsheet document, official 2010 grades, version 1). The calculation was performed by a Windows .net console (command line) application written in C# programming language interfacing with Oracle Database 10g Express Edition database. Histograms are obtained with Mathematica 7 (I saved relevant data in a database, I have no game results as they are not published, but as GS's and AGS3's formulae are identical and the only difference is in the value of 'k' factors, one can estimate AGS3 grades using GS grades and no actual game results, the C# program was written by me, Oracle Database 10g Express Edition database is free, but it has limitations imposed, some or all of which are lifted in commercial versions). Figure 1: Histogram for 2009 GS grades (consisting of 10153 grades in bins [0,1), [1,2), etc., of 1 grading point width, where minimum grade is 0.00, median grade is 133.00, maximum grade is 281.00, mean grade is 133.69 and standard deviation is 37.05). Figure 2: Histogram for 2009 AGS3 grades (consisting of 10153 grades in bins [0,1), [1,2), etc., of 1 grading point width, where minimum grade is 0.00, median grade is 133.50, maximum grade is 281.00, mean grade is 133.55 and standard deviation is 36.73). Figure 3: Histogram for 2010 GS grades (consisting of 10073 grades in bins [0,1), [1,2), etc., of 1 grading point width, where minimum grade is 2.00, median grade is 133.00, maximum grade is 276.00, mean grade is 133.33 and standard deviation is 37.46). Figure 4: Histogram for 2010 AGS3 grades (consisting of 10073 grades in bins [0,1), [1,2), etc., of 1 grading point width, where minimum grade is 1.00, median grade is 132.88, maximum grade is 276.00, mean grade is 133.09 and standard deviation is 36.99). My point in a nutshell is that the 'k' factors (wrongly chosen) in the current grading system are causing the grade stretching and that the amount of stretch (due to the 'k' factors) is larger (in fact it is equal to '|p - q|') than grade fluctuations caused by other anomalies which may be corrected by using FIDE logistic relation for 'p = f(d)', Glickman idea on changing less trusted grades (based on frequency of play) faster than more trusted grades, or even a solution to the "junior problem". In my opinion three candidates for replacing GS are AGS3, Ã‰GS5 and Ã‰GS6, with Ã‰GS6 as the best and Ã‰GS5 as the second best. Ã‰GS5 is sort of ECF equivalent of FIDE's Ã‰lo (logistic curve is used for 'p = f(d)', this is regarded as more accurate than the ECF's linear approximation; the grades are ECF grades, not FIDE ratings, i.e., a strong grandmaster is about 270 not 2800; grading is done every season rather than after every tournament; does not stretch the grades). Ã‰GS6 has similar improvement (taken in a simple from) over Ã‰GS5 as Glicko has over FIDE's Ã‰lo which accounts for a grade trust (or establishment) based on frequency of play (i.e., less trusted or established grades change more rapidly than more trusted or established grades, consequently, in extreme case, ungraded players do not affect the grades of graded players; uses logistic curve for 'p = f(d)'; does not stretch the grades). Of course not, it is only my belief. I published AGS3 grades in case somebody would like to examine the difference in behaviour between GS (official) and AGS3 (in my opinion the simplest 'improvement' over official grading system) grades. Maybe my definition of 'grade stretching' is not what the problem was (and why new GS grades were introduced), but at least it is a try. Last edited by Robert Jurjevic on Thu Nov 18, 2010 6:12 pm, edited 8 times in total. Peter Lalic is a chess colleague and a friend of mine whose GS grade was changed from 158 in 2008 to 185 in 2010. According to AGS3 Peter's 2010 grade should have been 177 (his AGS3 grade in 2008 was taken to be the same as GS grade, i.e. 158). Robert Jurjevic (that is me) is a weaker chess player whose grade remained pretty much constant during that period at approximately 120 (both Robert's GS and AGS3 grades were 122 in 2008 and are 121 in 2010). Let us assume that Peter and Robert decided to play a match (of sufficiently enough games) in 2011. If both players perform as expected (as their grades suggest) then according to GS Peter should score 95.1% and according to AGS3 93.0% in the match (calculated assumed logistic relationship between expected performance and grade difference, note that the grade difference is greater than 30, so one should use more accurate relationship between expected performance and grade difference). It seems that both 95.1% and 93.0% cannot be true at the same time. Which of the estimates of Peter's expected performance is more accurate? Let us assume that Peter scored 93.0% in the match (exactly what was expected by AGS3). According to GS grades Peter under-performed in the match. This can be due to a fact that during the match Robert became relatively stronger to Peter. Another explanation could be that both Peter and Robert indeed did perform as expected (i.e. Robert's relative strength to Peter hasn't changed) but that grades were not correctly calculated. If that was the case one may have corrected Robert's grade to be 129 (it may be better to leave the grade of the stronger player unchanged) in order to match Peter's performance of 93.0%. Let us assume now that somehow an analysis has been made which shows that all stronger players in general under-perform against weaker players. Then one may assume that this is not due to the fact that all weaker players improved in respect to stronger players (what is statistically very unlikely) but rather that something is wrong with the grade calculation. If that is the case one can make a correction to weaker player grades (increasing them) to match the observed performance of the stronger players in games against weaker players (this correction was done in 2008 and my grade went from the old 90ish to a new 120ish). My understanding is that this phenomenon was referred to as "grade stretching" (as it would seem that grade difference between stronger and weaker players is higher than what performance results suggest it should have been). If we assumed that Peter's 2010 grade was 177 as suggested by AGS3 (rather than 185 as suggested by GS) Peter's performance of 93.0% in the match would have been exactly what one would expected and the general conclusion may have been that the stronger players when playing against weaker players do perform as expected on average (hence no grade correction would have been needed). My intention is to keep calculating and publishing AGS3 grades until 2013. In 2013 one may perform an analysis which establishes if all stronger players in general under-perform against weaker players or not (a similar analysis which has already been done and led to grade correction in 2008, I understand), first using GS, then AGS3 grades (2013 is chosen in order to gather 5 years of AGS3 grade data, I understand that 5 year grade data was used in the original analysis which had lead to grade corrections in 2008). If GS grades suggest that the stronger players under-perform in the games against weaker players in general and AGS3 that they do not, then it is likely that my assumption about what is causing grade stretching was correct. If it would be shown that AGS3 does not stretch the grades and GS does then ECF may adopt AGS3 grades (which would already have been calculated by me) as official grades for 2013 and continue calculating grades in 2014, 2015, etc. either using AGS3 or Ã‰GS6 (which would have been better than AGS3 in cases where grade difference is greater than 30, and where players do play only a few games per season, their grade would charge more rapidly as it is less trusted as it is based on older games, also players who play more games wouldn't be so much affected by the results of games they play against players who play fewer games, their grade would change less rapidly as the grades of their opponents are less trusted, and in extreme case the games ungraded players play against graded players wouldn't affect the grades of graded players at all, actually as an extension to Ã‰GS6 there is a proposal in http://www.jurjevic.org.uk/chess/grade/ ... malies.htm in "Ungraded players" section for calculation of grades of ungraded players based only on the game results with no need for or reference to the estimated grades). AGS3 and Ã‰GS6 (with the mentioned extension for grade calculation of ungraded players) would not require any change in gathering data or timing when the collection or calculation is done, etc., and all the procedures would remain the same. The only difference would have been in a method of calculation which would anyway be given to a computer program to do. AGS3 has a benefit of the same simplicity as GS, so a calculation by hand would still be possible if AGS3 is used. Last edited by Robert Jurjevic on Wed Aug 04, 2010 9:56 am, edited 7 times in total. Please find below delta grade histograms for GA and AGS3 grades for 2009 and 2010 (2009 GS delta grade is defined as 2009 GS grade minus 2008 GS grade, 2009 AGS3 delta grade is defined as 2009 AGS3 grade minus 2008 AGS3 grade, 2010 GS delta grade is defined as 2010 GS grade minus 2008 GS grade, 2010 AGS3 delta grade is defined as 2010 AGS3 grade minus 2008 AGS3 grade). Delta grade is equal to a number of grading points one's 2009, 2010, etc. GS or AGS3 grade has changed in respect to his or her 2008 GS or AGS3 grade (year when new GS grades were introduced) and it is a measure or players' GS or AGS3 improvement or decline in 2009, 2010, etc. since 2008. Figure 1: Histogram for 2009 GS delta grades (consisting of 8624 delta grades in bins [0,1), [1,2), etc., of 1 delta grading point width, where minimum delta grade is -38.00, median delta grade is 0.00, maximum delta grade is 63.00, mean delta grade is 0.33 and standard deviation of delta grades is 8.13; delta grade is defined as 2009 GS grade minus 2008 GS grade). Figure 2: Histogram for 2009 AGS3 delta grades (consisting of 8624 delta grades in bins [0,1), [1,2), etc., of 1 delta grading point width, where minimum delta grade is -19.00, median delta grade is 0.00, maximum delta grade is 31.50, mean delta grade is 0.16 and standard deviation of delta grades is 4.07; delta grade is defined as 2009 AGS3 grade minus 2008 AGS3 grade). Figure 3: Histogram for 2010 GS delta grades (consisting of 7582 delta grades in bins [0,1), [1,2), etc., of 1 delta grading point width, where minimum delta grade is -39.00, median delta grade is 0.00, maximum delta grade is 80.00, mean delta grade is 0.52 and standard deviation of delta grades is 10.96; delta grade is defined as 2010 GS grade minus 2008 GS grade). Figure 4: Histogram for 2010 AGS3 delta grades (consisting of 7582 delta grades in bins [0,1), [1,2), etc., of 1 delta grading point width, where minimum delta grade is -23.39, median delta grade is -0.08, maximum delta grade is 47.75, mean delta grade is 0.40 and standard deviation of delta grades is 6.60; delta grade is defined as 2010 AGS3 grade minus 2008 AGS3 grade). Last edited by Robert Jurjevic on Thu Nov 18, 2010 2:45 am, edited 2 times in total. Last edited by Robert Jurjevic on Thu Nov 18, 2010 3:10 am, edited 1 time in total. "Please note that I have calculated AGS3 grades for 2009 and 2010 using GS grades for 2009 published in gradeslive.csv and GS grades for 2010 published in grades2010v1.csv. (I assumed that 2008 EGS3 grades are equal to 2008 GS grades and that number of games on which 2008 GS and AGS3 grades are based is 0.)" "The calculation was performed by a Windows .net console (command line) application written in C# programming language interfacing with Oracle Database 10g Express Edition database. 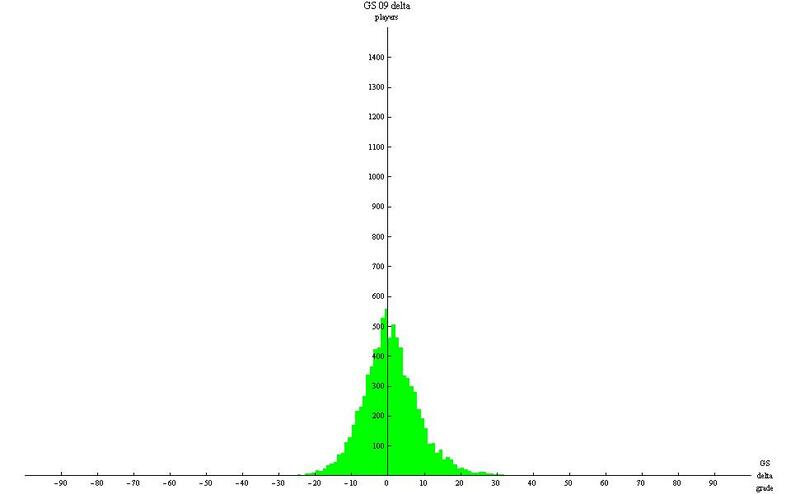 Histograms are obtained with Mathematica 7 (I saved relevant data in a database, I have no game results as they are not published, but as GS's and AGS3's formulae are identical and the only difference is in the value of 'k' factors, one can calculate AGS3 grades using GS grades and no actual game results, the C# program was written by me, Oracle Database 10g Express Edition database is free, but it has limitations imposed, some or all of which are lifted in commercial versions)." where 'A2' is new AGS3 grade, 'A1' current AGS3 grade, 'a2' new GS grade, 'a1' current GS grade, 'p' expected performance based on GS grades and 'P' expected performance based on AGS3 grades. I overlooked that 'p - P' is not zero. 'p - P' can be calculated from the actual game results, but if I would have actual game results I would use direct AGS3 formulae (so there would be no need to calculate 'p - P'), moreover then I would be able to calculate Ã‰GS6 grades as well. where 'A2' is new AGS3 grade, 'A1' current AGS3 grade, 'a2' new GS grade, 'a1' current GS grade and 'a0' previous GS grade. If the above approximation is good enough I will correct AGS3 grades for 2010 (AGS3 grades for 2009 are correctly calculated as for 2009 'p - P = 0' by definition) and continue to calculate AGS3 grades for 20011, 2012, etc. using the above formula. I erroneously used 'A2 = a1 +...' instead of 'A2 = A1 +...' and I overlooked that 'p - P' is not zero. where 'a0' is previous GS grade and 'a1' current GS grade. As both GS and AGS3 are preserving total system grade median of GS and AGS3 delta grades should be zero. (In probability theory and statistics, a median is described as the numeric value separating the higher half of a sample, a population, or a probability distribution, from the lower half.) This fact can be used to assess the error made by assuming that the average GS grade of the player's opponents did not change between current and previous season. Figure 1: Histogram for 2010 AGS3 delta grades (consisting of 7582 delta grades in bins [0,1), [1,2), etc., of 1 delta grading point width, where minimum delta grade is -23.39, median delta grade is -0.08, maximum delta grade is 47.75, mean delta grade is 0.40 and standard deviation of delta grades is 6.60; delta grade is defined as 2010 AGS3 grade minus 2008 AGS3 grade). As the median for 2010 AGS3 delta grades is -0.08 (which seems to be fairly close to zero) we may assess that the error made by assuming that the average GS grade of the player's opponents did not change between current and previous season is rather small. (AGS3 delta grade median of -0.08 means that the grades are ever so slightly more decreased than increased resulting in a rather small net grade decrease on average or a small grade deflation; in other words the AGS3 grade calculation approximately preserves total system grade). AGS3 grade estimation/ calculation with no game results seems to be fairly accurate (it is likely that the error for 2010 AGS3 delta grades is about -0.08 grading points on average). Please note that I think that I have found a way how to calculate chances for each outcome of a single game between two players if the grade difference is known. What is the chance of a 120 player playing White winning against a 140 player playing Black? Grade difference â€˜dâ€™ is â€˜d = 140 â€“ (120 + 5) = 140 â€“ 125 = 15â€™ and from the table it follows that for grade difference of 15 the chance of the weaker player winning against the stronger player is 16.7 percent. Table 3: Chance in percents of the stronger player losing (the weaker player winning) '50 - 1/2*f(d)', the players drawing '100 - f(d)', and the stronger player winning (the weaker player losing) '3/2*f(d) - 50' as a function of grade difference 'd'. Calculation is performed assuming logistic 'p = f(d)' (yellow line in figure 2) and that the most probable number of draws is the average between the maximum '200 - 2*f(d)' and the minimum '0'. White is approximately 5 grading points stronger than Black. (The estimation assumes that the average GS grade of the player's opponents did not change between current and previous season, which may be a fair assumption, but obviously needs not to hold. Nevertheless, AGS3 grade estimation/ calculation with no game results seems to be fairly accurate, it is likely that the error for 2011 AGS3 grades is about -0.10 grading points on average). The results can be found in ags3grade11.zip file which can be downloaded from... http://www.jurjevic.org.uk/chess/grade/. The Zip file contains ags3grade09.txt (textual tab delimited), ags3grade09.xls (Excel spreadsheet document), gradeslive.csv (Excel spreadsheet document, official 2009 grades), ags3grade10.txt (textual tab delimited), ags3grade10.xls (Excel spreadsheet document), grades2010v2.csv (Excel spreadsheet document, official 2010 grades, version 2), ags3grade11.txt (textual tab delimited), ags3grade11.xls (Excel spreadsheet document) and grades2011v2.csv (Excel spreadsheet document, official 2011 grades, version 2). The calculation was performed by a Windows .net console (command line) application written in C# programming language interfacing with Oracle Database 10g Express Edition database. Histograms are obtained with Mathematica 7 (I saved relevant data in a database; I have no game results, as they are not published, but as GS's and AGS3's formulae are identical, and the only difference is in the value of 'k' factors, one can estimate AGS3 grades using GS grades with no actual game results; the C# program was written by me; Oracle Database 10g Express Edition database is free, but it has limitations imposed, some or all of which are lifted in commercial versions). 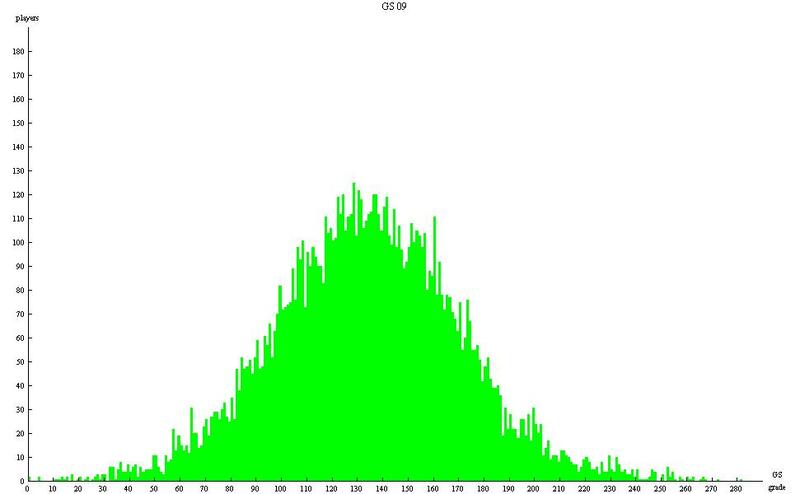 Figure 1a: Histogram for 2009 GS grades (consisting of 10153 grades in bins [0,1), [1,2), etc., of 1 grading point width, where minimum grade is 0.00, median grade is 133.00, maximum grade is 281.00, mean grade is 133.69 and standard deviation is 37.05). 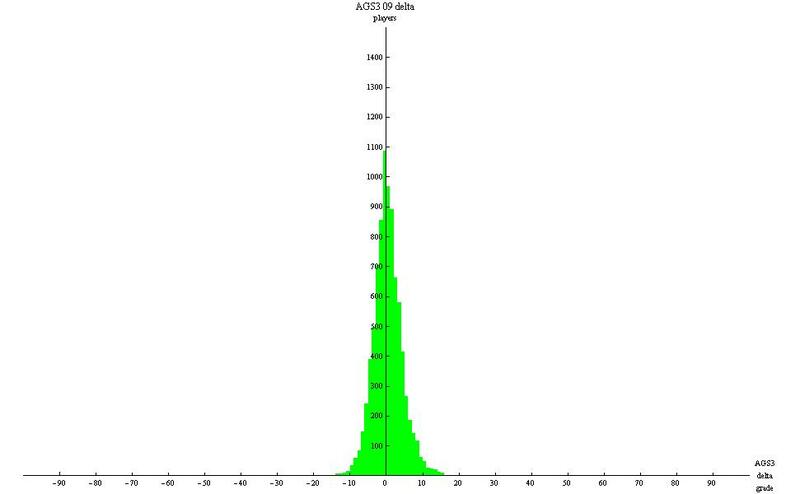 Figure 1b: Histogram for 2009 AGS3 grades (consisting of 10153 grades in bins [0,1), [1,2), etc., of 1 grading point width, where minimum grade is 0.00, median grade is 133.50, maximum grade is 281.00, mean grade is 133.55 and standard deviation is 36.73). Figure 2a: Histogram for 2010 GS grades (consisting of 10073 grades in bins [0,1), [1,2), etc., of 1 grading point width, where minimum grade is 2.00, median grade is 133.00, maximum grade is 276.00, mean grade is 133.33 and standard deviation is 37.46). Figure 2b: Histogram for 2010 AGS3 grades (consisting of 10073 grades in bins [0,1), [1,2), etc., of 1 grading point width, where minimum grade is 1.00, median grade is 132.88, maximum grade is 276.00, mean grade is 133.09 and standard deviation is 36.99). Figure 3a: Histogram for 2011 GS grades (consisting of 10104 grades in bins [0,1), [1,2), etc., of 1 grading point width, where minimum grade is 0.00, median grade is 133.00, maximum grade is 296.00, mean grade is 132.96 and standard deviation is 38.57). 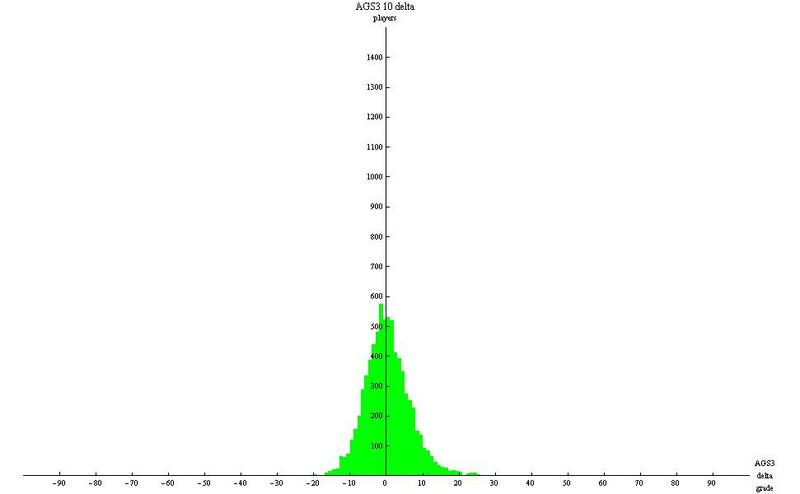 Figure 3b: Histogram for 2011 AGS3 grades (consisting of 10104 grades in bins [0,1), [1,2), etc., of 1 grading point width, where minimum grade is 0.00, median grade is 132.12, maximum grade is 296.00, mean grade is 132.56 and standard deviation is 38.07). My point in a nutshell is that the 'k' factors (wrongly chosen) in the current grading system are causing the grade stretching and that the amount of the stretch (due to the 'k' factors) is larger (in fact it is equal to '|p - q|') than grade fluctuations caused by other anomalies which may be corrected by using FIDE logistic relation for 'p = f(d)', Glickman idea on changing less trusted grades (based on frequency of play) faster than more trusted grades, or even a solution to the "junior problem".